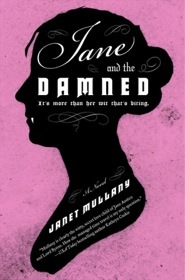 Janet Mullany puts her spin on the literary monster mashup trend with Jane and the Damned, which imagines Jane Austen as a vampire (tagline: “It’s more than her wit that’s biting.”). In this version of 18th century England, sophisticated vampires known as “the Damned” live fairly openly amongst humans. Though decent folk are scandalized by the Damned, most are fascinated by the vampires’ beauty. As a preacher’s daughter and country dweller, Jane has never seen a vampire until she attends the Basingstoke assembly with her sister Cassandra and friend Catherine Bigg, and becomes one of the Damned herself. Abandoned by her creator, Jane is left to figure out the whole vampire thing on her own. The only known cure for vampirism are the waters at Bath, so Jane’s family takes her there with the hope of saving her. In Bath, Jane meets a charming vampire, Luke Venning, who offers to become her mentor and teach her the ways of the Damned. With the French about to invade England and throw the Austens into the middle of a war, Jane decides not to take the cure so that she can fight the French. But will she choose to remain a vampire after the war is over? It should be no surprise that Jane Austen makes a very witty vampire (“You damned Damned.”). It was fun to see Jane forced to abandon the rigid manners and politeness of her time and embrace her bloodlust. I think Jane and the Damned does everything right—it captures the feel and romance of a Jane Austen novel without being too dry, and the vampires add to the story and spice things up without requiring you to suspend too much disbelief. I’ve only read a few of these monster mashups, none of them featuring Jane Austen, so I’m certainly no expert. But I will say that I liked Jane and the Damned WAY more than Pride and Prejudice and Zombies (which I gave up on), but slightly less than Abraham Lincoln: Vampire Slayer (one of my favorite books so far this year). I recommend Jane and the Damned to any Jane Austen fan with a sense of humor and an appreciation of vampires. Check out the book trailer for Jane and the Damned.